What are the origins of the May Cross Fiesta? 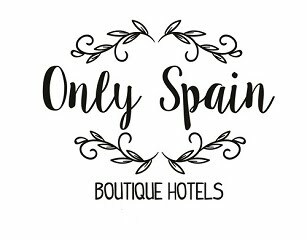 This year in the old quarter of Jaén twenty-nine crosses are taking part in the eons old tradition of making huge crossed out of flowers at the beginning of May. Not only crosses but whole patios are filled with flowers. I´m hoping to get out and track some down if this rain will just go away, I found one year and the nun sweeping the steps invited me into the patio, then showed my their chapel. Fantastic old building in the old quarter of the town that I hadn´t even realized was a convent or church, no name on things here. I´m planning on tracking down the convent famous for their pastries and buying some via the original wooden turntable on the door, to keep out spying eyes and contact from the world. Its history seems a little dulled but the most popular Spanish legend is about the Emperor Constantine, when in the sixth year of his reign and confronted by barbarians on the shores of the Danube, an impossible battle to win due to the size of the enemy battalion, had a vision. "In hoc signo vincis" (with this sign you will win) above it. The Emperor made a cross and they held it in front of their troops. They won the battle and on his return discovered the significance of the Cross, became baptized as a Christian and ordered churches to be built. He then sent his mother, Santa Elena, to Jerusalem in search of the true Cross of Christ. With help from the local priests she traced the place where Christ was crucified and found not only one Cross but three semi-hidden blood covered crosses. In order to find out which one was the Cross of Christ she placed parts of each cross onto sick and even dead people, those touched by the Cross which was Christ´s were healed and even raised from the dead. From that day forward Santa Elena instigated the creation of crosses on the day that she found the true Cross. 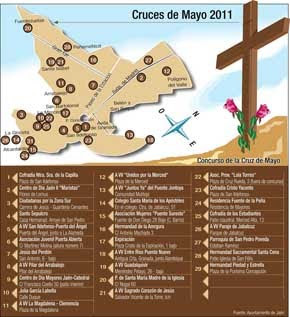 Labels: crosses of May cruces del mayo meaning May Crosses history What are the origins of the May Cross Fiesta?